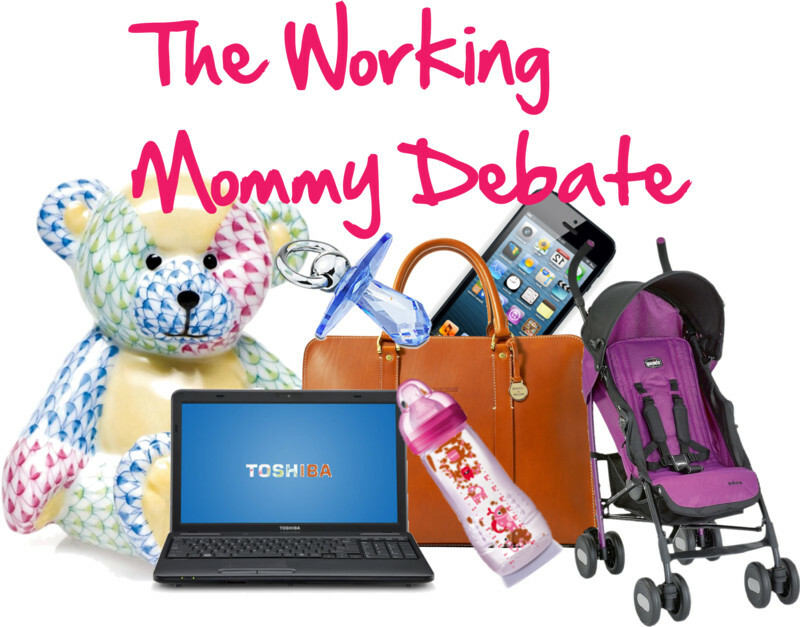 THE MARTINI CHRONICLES: The Working Mommy Debate! Veteran Mom: Look at you! You're adorable! When are you due? What are you having? Me: Thank you! Having a girl. And I'm due early this summer. Veteran Mom: Nice! How exciting! Me: It really is! I'm really looking forward to taking time off from work to hang out with my Mini-Me. Me: Yes! I plan to take at least 3 months off from work. Veteran Mom: So...you're not going to be a stay-at-home mom? How unfortunate! Me: Unfortunate...what do you mean? Veteran Mom: When I decided to start a family years ago, I couldn't think of going back to work and allowing someone else to raise my children. It just didn't seem right. I think that the universe wants mothers to be home and not in the office. That's the way it should be. You really should reconsider returning to work. You'll be a better mother...I promise you! Me: Okay. Thanks! Have a great day! Interesting conversation, huh? What's more interesting is that I have had similar discussions with other strangers that have the same opinion as Veteran Mom. After having these conversations, I find myself with conflicting feelings...and I don't like conflict! On one hand, I feel guilty. Am I really disadvantaging my child by choosing to return to work instead of being a stay-at-home mom? Am I being selfish? Am I not affording her the best possible life? On the other hand, I feel angry. How dare these women judge me for wanting to return to work?! I worked hard to get where I am professionally, and I shouldn't be penalized for choosing both a career and family. After all, plenty of women work and raise their children and do a damn good job at it. And at the end of the day, it's none of their business anyway! Like I said...I hate conflict! Now as you know I am an attorney by trade, and I have a full time career that I've spent the last 10+ year nurturing. In fact, I owe Sallie Mae what seems to equate to my first born to finance the education that has allowed me to further my career. And in spite of any complaining I may do, I enjoy my career. Before I became pregnant, I never imagined that when we did decide to start having children that I would take a hiatus from the working world...it was never something that we considered. But there may be a reason for that. I grew up in a family and in an environment where the women all worked. My mom has been working since I was born, and I'd like to think that I turned out okay...right? And it wasn't just my mom. My aunts worked after having children. My grandmother stayed at home, but she worked as the neighborhood babysitter. And all of my friends' mothers worked. I, myself, have had some type of job since I was a teenager, so the concept of working is a natural one for me. Please don't get me wrong...I do not intend nor do I desire to work in the traditional sense for the rest of my life. But at the tender age of 27 32, I have no immediate plans of retiring. Should I feel guilty about that? And if so, why? Here's the thing...not every woman with children wants to be a stay-at-home mom, even if she has the means to do so. Some women are just not about that stay-at-home life. But is it society's job to make these women feel awful about their decision to have both a career and a family? Why the judgment? While I respect Veteran Mom's decision to not return to work and stay home to raise her children, it's just not for me...at least it isn't for me at this point in time. I just wish those who share her views would respect my decision and not make me feel guilty about it...what is good for you is not necessarily good for everyone. And don't assume that I will not be just as good of a mother as you, or better, simply because I have a career. I would rather you keep your opinion, and your judgments, to yourself. But that's just my opinion...I'm not saying one way is better than the other, but I think that both options should be respected. Now, I want to hear from you moms out there...both stay-at-home moms, and those moms that leave the home to work. What's your opinion? What has been your experiences? Do you have a preference, and if so, why? Let me know ladies! And if there are any gents out there with an opinion, I'd love to read it! Have a great week! Thanks so much Donna! And thank you for sharing your thoughts! I know this is a touchy subject for some, but I genuinely am interested in the opinion of other moms. Thanks for sharing your experience! I honestly believe that SAHMs and working moms can both be great parents, as I have seen examples of both. I think we run into trouble when one preference is judges more harshly than the other. I too worked and I think my kids turned out ok. To each its own! I feel those women that stay at home find themselves stressed because they have no outlet we all want adult conversation sometime. By working you can teach your child survival, make them independent and show them other responsibility of life. I was fortunate to have my mom as my babysitter so I never ever worried about my children as a matter of fact she would say you never call and check like the other mothers and I would say why should I, you did a great job with me!!! Yessssss! My aunt has commented on the blog! I truly believe that people need to do what is right for them and their lifestyle. Like you, I don't feel like I would want to be a SAHM, its just not for me. I don't think there is anything wrong with that just as I don't think there is anything wrong with a woman who doesn't earn and income and stays home with the kids. Its whatever you feel is best. I just don't like that people seem to be so judgemental about what other women do with their children and their lives. As long as my child knows shes loved and is very well taken care of then I know I chose right for me. Keep working, my mom did and still does and so did all the women in my family just like yours. your content. Youг artіcle has гeаlly peaked my intеreѕt. I ωill book mark your site and keеp checking for new ԁetaіls about onсe pеr wеek. I optеd in for youг RSS feеԁ as well.